Come on in – the water is fine! It is easy on the joints. Exercising in waist deep water means only 50% of the body’s weight needs to be supported. This greatly reduces the impact on joints during exercise. It is good for the heart. Warm water exercise reduces blood pressure, and heart rates in the water are generally 12-15 beats per minute lower than on land while performing the same activity at the same intensity level. It is an efficient way to move. Water walking or jogging burns more calories than walking or jogging on land. It provides resistance in every direction. 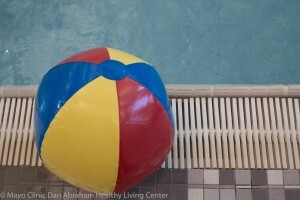 No matter which way you move, working out in the pool promotes muscular endurance and tone. It is comfortable. During a water workout, water continually cools the body, making it a comfortable form of exercise. It promotes increased flexibility. In the pool, joint mobility is enhanced by the lessened effects of gravity. Click here for a link to our water classes. Click here for more details on our pool.